For all intents and purposes, cards that are dealt on any independent poker hand are random, are independent of the previous hand dealt and have no influence on the next future hand to be dealt. It is a mistake to look for patterns in independent events. Statistically, there is no such thing as a streak of either great hands or poor hands. Your brain, however, is hard wired to identify patterns from independent occurrences. We are really good at identifying complex patterns. Facial recognition is one of those pattern buffers that functions well in our brains. We recognize people we know even when we have not seen them for a long period of time and they have changed physically because of age or weight gain, or hair style, or glasses, or a beard, or, well you get the point. On other occasions we tend to recognize patterns that simply are not there. Astrological signs, phases of the moon, speaking of the moon, many people recognize a man’s face in the moon while others see a woodsman gathering sticks and still others see a rabbit all created by the random pummeling of the moon by space debris eons ago. There are completely false patterns that may be created through deception. Medical experiments that use a placebo see cures for people taking the placebo. Game theory experiments can be altered by simply telling one side and not the other about what to expect from the other side whether the information is true or not. These glitches may or may not serve a purpose in life, but at the poker table they may, in fact, cause problems. If not Patterns, What may I Rely On? Thinking you can identify patterns and base your action on any given hand based on the identified pattern is a road to ruin. Wait, you say, haven’t you written about observation to recognize patterns in your opponents? Of course I have. People are quite good at inventing a pattern of behavior and acting on the fundamental parameters of that pattern. Human behavior is not random. Dealing two cards, however, is a random act, unless there is cheating at the table. Pattern identification is really nothing more than expecting that what has occurred in the past is a good predictor for behavior in the present. In human behavior that is a reasonably appropriate approach to understanding what your opponent might do in any given hand they choose to play. Transferring that expectation to cards being dealt is a mistake that will, in the long and short run, cost you money. What you can, in fact, must rely on when events are random in their very nature is the probability of occurrence will occur rather than reading into the independent act of dealing shuffled cards to players at a poker table a non-existent pattern. Knowing your odds and playing accordingly is simply not an option at the poker table. The odds, for example, of being dealt two specific cards are 220:1 against. That means that once in 221 deals you will be dealt AA. I also know that if I am dealt AA those aces will be cracked about 15% of the time. None of this precludes my being dealt AA two or three times in a row. Each deal is an independent event which is completely independent of past events. No deal carries with it a predictive value that has an influence beyond the influence of probability. The most profitable thing you can do at the poker table is to break your pattern recognition software or, at the very least, turn it off. You don’t run bad or run good. Everybody but you doesn’t always make a draw. Being dealt KK is not a magnet for your opponent being dealt AA. Each of the hands dealt are the result of a random sequence of events that are independent of every other event. Your two cards are independent of every other two card hands at the table. Unless, for example, you hold AA your hand is susceptible to having a better hand being dealt and depending on what two cards you hold there are probabilities that may be calculated for each random occurrence, period. 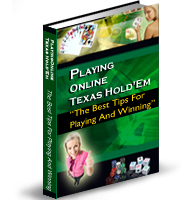 Get over your desire to find nonexistent patterns and get on with the program of learning poker odds, probabilities and poker math. You’ll be better off in the long run.